Back in the days before Twitter allowed us to find out what they were having for breakfast, pop stars could be quite mysterious and there was no act quite as mysterious as Kraftwerk. After they released their albums, they would invariably carry out a perfunctory bit of promotional work (usually, if memory serves, on the TV science show 'Tomorrow’s World') and maybe do the odd concert, after which they would retreat to their studios in Dusseldorf (the splendidly named Kling Klang) to start work on their next project, or maybe that should be projekt. When I say they ‘started work’, that would have been a guess. In those days, we had no idea what those mysterious Germans got up to. Years would pass; pop fashions and prime-ministers would come and go, but Kratfwerk wouldn’t even answer the phone. What were they working on? New music? Testing new synthesisers? Building robots? Constructing a time machine? Or perhaps a combination of all of the above? It turns out, according to David Buckley’s biography, that they were quite often goofing around with gizmos, enjoying coffee and pastries or indulging in that most rock and roll of pastimes, cycling. Their imperial phase came in the mid-to-late seventies, with the albums ‘Radio-Activity’, ‘Trans-Europe Express’ and ‘The Man Machine’, with the latter -for my money- representing their finest work; the composition, structure and pacing on that album is flawless, a perfect realisation of their artistic vision. I love Kraftwerk’s warm analogue sounds and insistent rhythms, but my affection for their music is also informed by memories of a time when they didn’t just 'represent' something new; they were something new. In the 21st century, electronica has become the lingua franca of pop, but in the seventies, Kraftwerk were revolutionary, not in the sense of having anticipated or embraced the latest fashion or sounds, but in the sense of having invented a new way of making music, of having forged a new language for pop. That might be something that only a middle-aged person would say and, to be honest, I am not unsympathetic to Buckley’s ‘dad watching Top of the Pops’ view that pop and rock appears to have evolved into a self-referential ‘curator’ culture, wherein pretty much everything we hear now is ‘a bit 60s’ or ‘a bit folky’ or maybe ‘a bit RnB’ or ‘a bit 80s’. The author points out (correctly, in my view) that, by the time they had released ‘Computer World’ in 1981, the world had caught up with Kraftwerk. For the first time, they sounded contemporary, part of the pop landscape, where –just a few years earlier- they had sounded like they had arrived from the future. In the 1980s, their output declined to the point where to have described it as ‘sluggish’ would have been a generous exaggeration. The two main creative forces, Ralf Hutter and Florian Scheider, were happy living off the royalty cheques from the likes of 'Autobahn' and 'The Model' and were so into their cycling that the other two members, Karl Bartos and Wolgang Flur, had to find other ways to pay the bills. Buckley offers some good background material on the German cultural milieu of the late 60s and early 70s, but the book leans rather too heavily on interviews with musicians who have been influenced by the band. The author also reveals a bit too much about his own political views, which I’d wager are of no real interest to most readers. As one might expect, Ralf and Florian only appear in snippets from old interviews. Even in the age of social media, there exists an information black hole out of which very little emerges about these men; we know as little about them as we did thirty five years ago. Karl Bartos makes a modest contribution, but I suspect that he is keeping his powder dry for a book of his own. 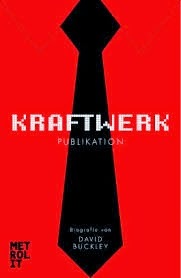 This might not be the definitive tome on Kraftwerk, but if you’re a fan of the band it’s a pretty good read. If you’re waiting for a comprehensive warts-and-all guide to the life and work of this fascinating combo, I’d advise you not to hold your breath.